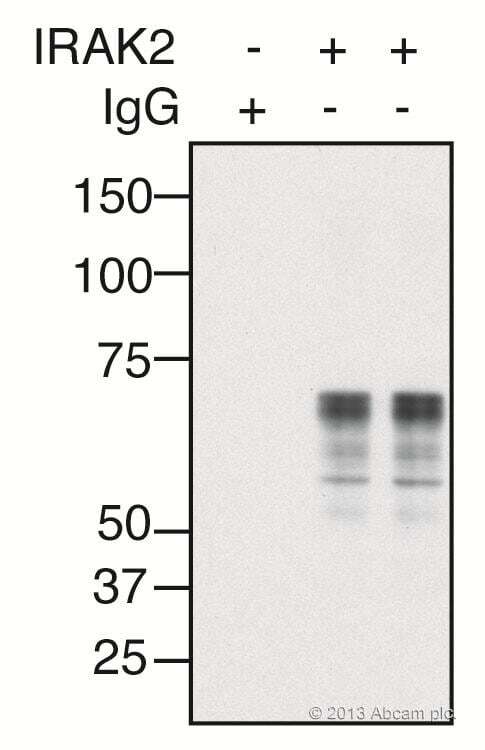 At least 20 blots, based on a 1 µl/ml dilution and 5 ml diluted antibody per blot. 1. The anti-mouse IgG for IP secondary antibody (HRP) detects mouse IgG antibodies (subtypes: IgG1, IgG2a, IgG2b, IgG3). 2. The anti-mouse IgG for IP secondary antibody (HRP) preferentially detects the non-reduced form of mouse IgG (IgG1, IgG2a, IgG2b, IgG3) over the reduced, SDS-denatured forms. Our Abpromise guarantee covers the use of ab131368 in the following tested applications. The optimal dilution will depend on the sensitivity of the HRP substrate. IP sample preparation: Caspase 7 was immunoprecipitated from 0.5 ml of 1x107 Jurkat (Human T cell leukemia cell line from peripheral blood) cells/ml with 5 µg mouse anti-human Caspase 7. WB conditions: Precipitate from 1x106 cells was subjected to electrophoresis, transferred to an PVDF membrane, and immunoblotted with an anti-Caspase 7 antibody. Lane 3: Lane 1 was re-immunoblotted using an HRP-conjugated anti-mouse IgG H&L secondary antibody. 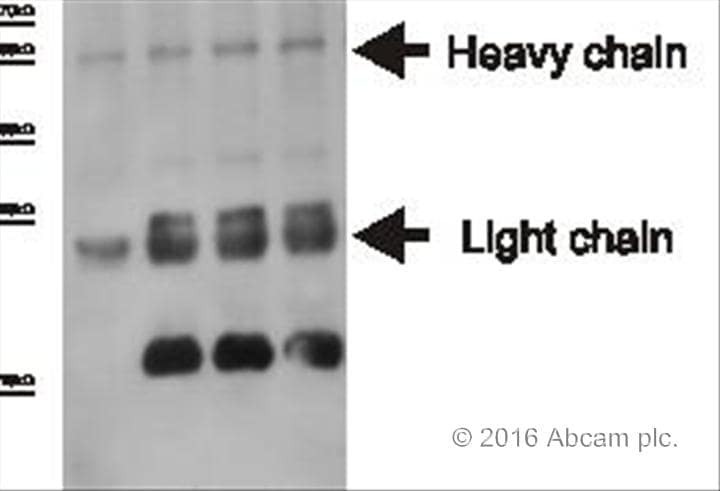 The heavy and light-chains can now be seen, confirming that although the immunoprecipitating heavy and light-chains are present, ab131368 detects only native antibody and not denatured heavy and light-chains. Please note the detection of the heavy and light-chains of the immunoprecipitating antibody in Lane 2 but not in Lane 1. Publishing research using ab131368? Please let us know so that we can cite the reference in this datasheet. IRAK2 was immunoprecipiated from 1 mg HEK293 WCE, run on an 8% gel and western blotted with the same antibody. The veriblot secondary antibody was used at a concentration of 1/10000 for 1 hr at room temp before detection by ECL. Hi. Does the antibody react to the mouse antibody run under a non-reducing SDS-PAGE? I just want to verify the description above. It detects mouse antibody run under native PAGE but not reducing SDS-PAGE. How about in the condition of non-reducing SDS-PAGE? This is what I am looking for. Just one question. Which light chain it is detecting? Kappa or lambda? or both? We do not know where the epitope this rat monoclonal antibody recognizes is located on mouse IgG, whether light chain or heavy chain, or if it contains amino acids from the light and also the heavy chain. We do know that the antibody will recognize mouse IgG containing either kappa or lambda light chain, and that the epitope is present only on non-denatured IgG. If the epitope contains light chain amino acids, it is assumed they are identical in kappa and lambda. It is a full-length human protein with a C-terminally located Fc-tag. We want to detect sialic acid (STn) on the O-glycosylation site of the reporter protein by immunoblotting. Blocking is performed with 3% BSA. Thank you very much for the time taken giving me furthrt infotmation. I can confirm that the Goat F(ab')2 polyclonal Secondary Antibody to Mouse IgG - (Fab')2 (HRP), pre-adsorbed could overcome the cross-reactivity with the human Fc. However we regrattably cannot give a guarantee for it. If the immunoblot is performed under denatured and reduced conditions I would recommend to have a look at our anti native antibodies (VeriBlot). This secondary antibodies will not react with denatured proteins. For the use of this antibodies it is improtant to have fully denatured samples. The blocking should be performed with milk (Please read the data sheet carefully). If you https://www.abcam.com/mouse-igg-veriblot-for-ip-secondary-antibody-hrp-ab131368.htmlyou will find the Anti-mouse IgG VeriBlot for IP secondary antibody (HRP) - ab131368 that might be suitable for the experiment. I hope this information is helpful. If you have further questions please do not hesitate to contact us again. Thanks for you quick response! See attach is the picture with the label of marker bands. a. Lane 2 and Lane 7 are expected. Lane 2 was the total lysate of 293T transfected with V5-KGA and Lane 7 was the total lysate of Hela as positive control. b. 5% BSA in TBST buffer for 1 hour at RT; and also the same for primary antibody incubation. But for secondary is only TBST buffer. "after" means the lysate from the supernatant after incubation with primary antibody and A/G beads. c. I did not do the control blot. "4. Milk should be used as the blocking protein for the immunoblot." I suggest using milk as the blocking buffer in efforts to reduce background on the blots. Also, please ensure that the samples loaded onto the gel are fully reduced prior to loading. anti-mouse secondary antibody for IP, respectively. I have try to validate the WB and IP for ab60709. Attach is the results I got. Unfortunately, I could not get the positive results, see lane 7, page 1.
you help me trouble shooting for that? Thanks! Thank you for your enquiry and for including all your data. That was very helpful. b. background is quite high in both figures 1 and 3. What blocking buffer was used? a. What are molecular weights of molecular weight marker bands? b. What does "before" and 'After" refer to? in page 3 and 4? c. Have you done a 'no primary' control blot? Overall it looks like no antibody specificity because commassie stain looks just like WB images. I recently purchased an anti-Lamin A+C antibody, made aliquots and then stored it at -20C. I used it for the first time the other day for a western blot of nuclear fractions,mitochondrial and ER fractions from mouse heart and liver. The attached file is that of the blot. Any thoughts on the appearance of the blot? Samples were kept on ice the entire time, protease inhibitor was present in the buffer. Fractions were re-suspended in RIPA buffer and 50ug of total protein was loaded per well. Thank you for contacting us. I am sorry that ab8984 is giving poor results in WB. Have you validated your transfer at the higher molecular weights by Ponceau stain? If the transfer is incomplete, that could account for the lack of the specific band. You could try transferring longer or adding 0.1% SDS to the transfer buffer and lowering the methanol percentage to 10%. If you are able to detect the specific band with these alterations, you may be able to reduce some of the background bands. The bands around 25 and 50 kDa may be due to the secondary antibody cross-reacting with endogenous IgGs (this can be checked by running a no primary antibody control). If you are getting background due to endogenous IgGs, you could switch to a secondary antibody that is specific for native IgGs, such as our VeriBlot secondary ab131368. Could you please let me know what dilutions and incubation times you were using for your primary and secondary antibodies? What blocking agent was used and at what percentage? I hope this helps, if not, I will be happy to offer you a free of charge replacement, credit, or refund. Please let me know your original order number and how you would like to proceed and I will be happy to help you help you further. Thank you for contacting us. I am sorry that this antibody is detecting multiple bands in WB on rat samples. Is the secondary antibody you are using pre-adsorbed against rat? It is possible that the anti-mouse secondary may be detecting the heavy and light chains of endogenous IgGs. The heavy and light chains tend to run around 50 and 25 kDa respectively, but variations in buffer system and sample preparation could raise the observed molecular weights and this may account for the bands around 60 and 27 kDa. I would recommend using a preadsorbed secondary antibody, or a secondary antibody that is designed to only detect native IgGs, such as our new VeriBlot range (ab131368 for example). I would also recommend loading no more than 50 ug of protein to ensure the maximum specificity possible, especially when using a very sensitive ECL reagent. I hope this helps to improve your results, if not, I will be happy to offer you a free of charge replacement, credit, or refund as long as you have purchased the antibody in the past six months. Please let me know your original order number and how you would like to proceed and I will be happy to help you further.